Stefan Simanowitz writes from Baalbek and Tripoli. People are afraid that life will become less safe for locals and refugees. Ali lives with his wife, brother-in-law and eight children in a graveyard. Their home is a one-roomed, 10’ x 10’ concrete hut next to some new graves in Jalil, a Palestinian refugee camp in Lebanon’s Bekaa Valley with far too many people. Before they moved here, people used the hut to wash dead bodies before burial. There are still two large metal washing tables by the outside wall. But Ali and his family are not afraid of living with the dead. They ran away from Yarmouk refugee camp in Syria six months ago. ‘We are Palestinians. We are not afraid of anything’ Ali says bravely. Then he added: ‘Of course as a father I was afraid for the safety of my children. That is why we came to Lebanon.’ Recently, it seems as if the violence they ran away from is following them over the border. Jalil refugee camp is in Baalbek, a small town near the Syrian border. On the first weekend of June 2013, more than 12 rockets shot from Syria landed just outside the town. There were no injuries but the week before, in Hermel near Baalbek, a young girl was killed and a woman injured. On Sunday 2 June, fighting between Hezbollah and the Free Syria Army went over the Syrian border into the mountains close to Baalbek. Reports say that at least 14 people died. Everyone has seen that people are now fighting on Lebanese land. Israeli jets flew low over Baalbek on Sunday morning. Baalbek is controlled by Hezbollah. It has been an open secret for a long time that Hezbollah fighters have been crossing the border into Syria to fight with Assad’s forces. But this was only stated openly by Hezbollah Secretary-General Hassan Nasrallah in a speech on 25 May. Since 19 May the fighting has increased to control the important Syrian rebel-held town of Qusair. This is only10 kilometres from the Lebanese border. 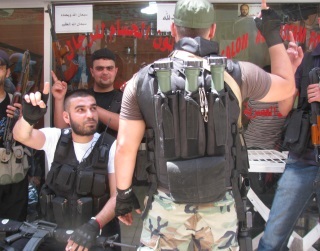 There is also more fighting in Baalbek province and in Lebanon’s second city, Tripoli in the north of the country. There has been fighting for decades between Sunni and Alawite in Tripoli’s two districts of Bab al-Tabbaneh and Jabal Mohsen up the hill. But the ‘siege of Qusair’ is now at the same time as increased fighting in the city. Eight days of heavy fighting at the end of May left nearly 30 dead and over 200 injured. After a short rest, fighting started again on Sunday 2 June. So far, six people have died and 38 have been injured. Everyone knows that the fighting between these two neighbours is very much connected to the war in Syria. People persuaded Sunni fighters to stay at home to defend Bal al-Tabbaneh rather than join the anti-Assad forces in Syria. If the fighting in Tripoli continues, it is possible that more Lebanese fighters in Syria could return to Lebanon to fight much closer to home. When I was in Baalbek soon after the start of the fighting in Qusair, there were five funerals for Hezbollah fighters. There were posters of the ‘martyrs’ along the streets, many heavily-armed men in black droving from the mosque to the cemetery, and the bodies of the fighters in ambulances in simple wooden coffins. We could hear some guns, but the funerals did not affect the refugees in Jalil, who had more important things to worry about. The United Nations thinks that more than 56,000 Palestinians living in Syria have had to leave to go to Lebanon over the past two years. 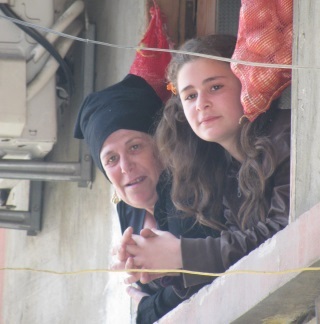 They have gone to a well-established Palestinian refugee community of more than 400,000 people. The other Syrian refugees get help from the UN, but these Palestinians coming from Syria get no help. They have to rely instead on the United Nations Relief Works Agency (UNRWA), which has less money. 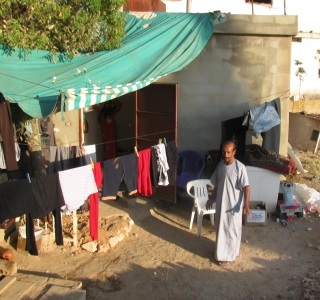 ‘UNRWA should help us, but the help is not nearly enough’ says 40-year-old Imad Erjaya who came from Khan Eshieh Palestinian refugee camp in Syria with his five brothers and their families in February. They all live together in terrible conditions in two small concrete rooms. ‘How many of us sleep in here at night? 28? 29? If you want to know, count the shoes outside and divide by two,’ he says. His mother, 75-year-old Fatima, who was forced to leave her home for the second time in her life, is very sad. ‘I have suffered so much. Sometimes I think it would be better to die than to live in this situation’ she cries. This page was last edited on 22 June 2013, at 20:27.